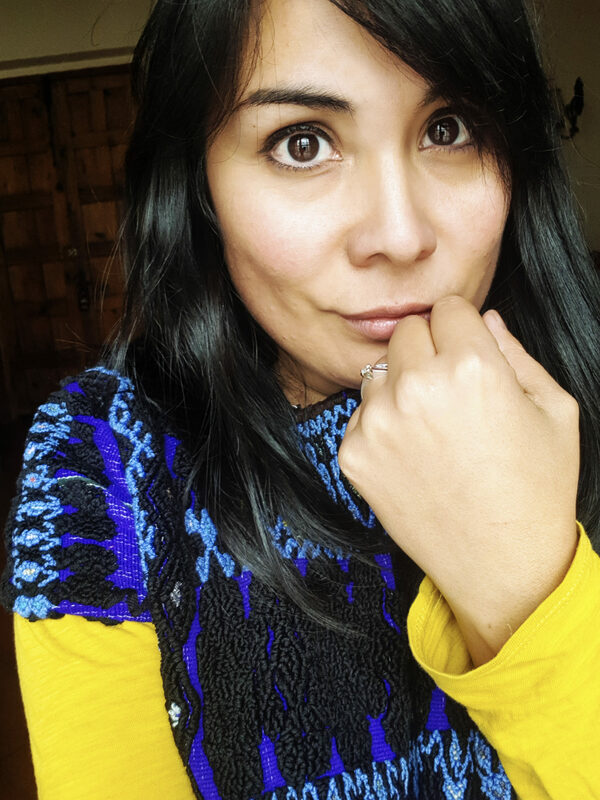 Following the Slow Travel Stories ft. Bohetnika from Mexico, Lizeth a traveler with heart, a passionate wanderluster and social entrepreneur share with us the second part of her journey. Volume two shows the impresive city of Oaxaca, this time with her husband Alex Behrendt and Bohetnika‘s partner. 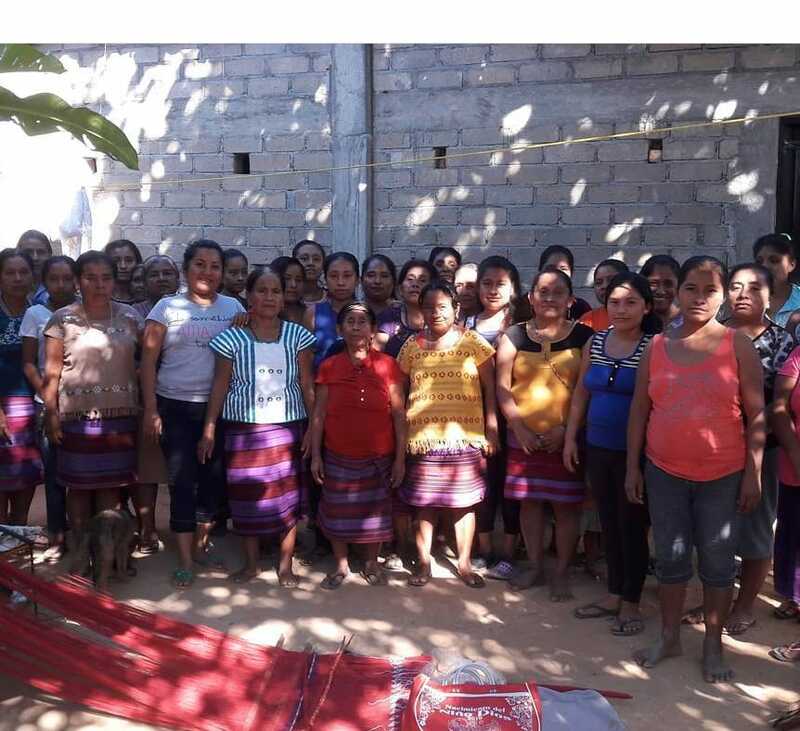 Alex an incredible support for Liz in this entrepreneur journey as she quotes “despite Alex not being in front of the camera, his commitment, support and passion for Mexico have been one of the pillars and reasons for Bohetnika to continue sharing their story andn moving forward”. Starting with Mexico City, where we rented a car to head south to Oaxaca. Those who have traveled there, will not let me lie the incredible views and landscapes, just spectacular. Perfect for Cactus lovers, this is a Cactu’s paradise! 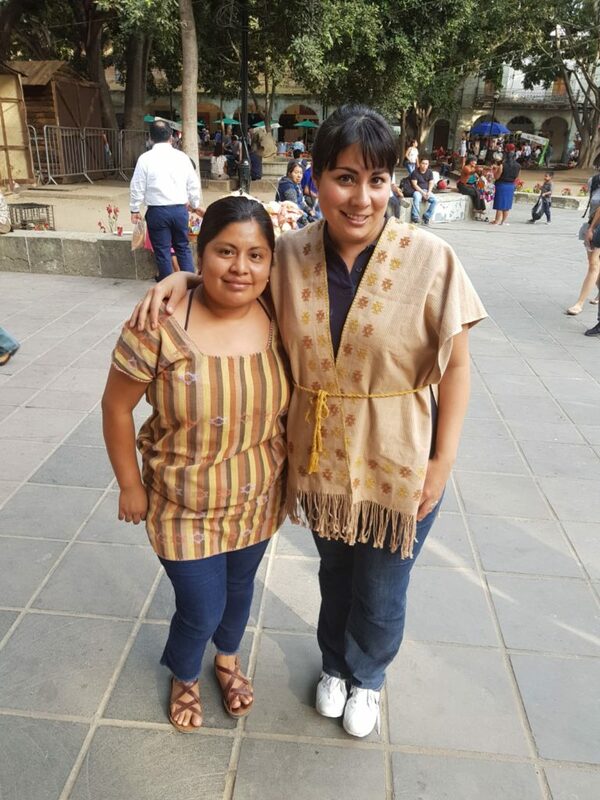 Our first appointment was with the artisan Nayelli Lorenzo, from the community of San Juan Colorado, a town that borders the state of Oaxaca. 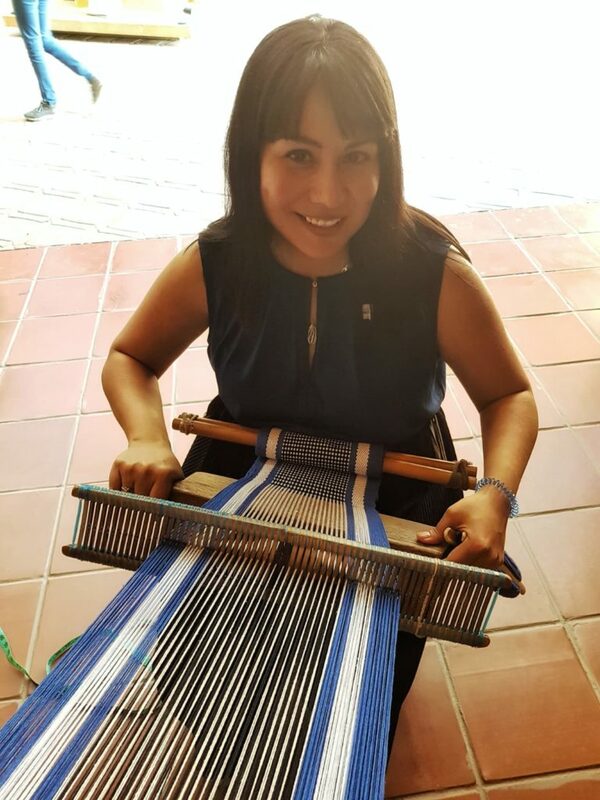 She came in the company of her family representing a beautiful cooperative of 200 women artisans called “Jiñi u’ñu”. They are the ones who make beautiful huipiles in waist loom with figures that represents culture, heritage & tradition of a whole community coming to life through natural dyeing obtained from plants and flowers of nearby surroundings. A truly work of art! Do you want to see the process? It is definitely unique, basically they use natural ingredients such as Cempasúchitl flower which is famous for being used in the festivities of the Day of the Dead in Mexico, from there you get a beautiful yellow color. There is another herb which they call “The grass of love” where they obtain that special purple color. The green is obtained from the fresh indigo and there is another shade of lighter yellow which is obtained from the guava leaf. This community work with “Coyuche” cotton, which is a light brown cotton typical of Oaxaca, which is commonly found in the coastal area. 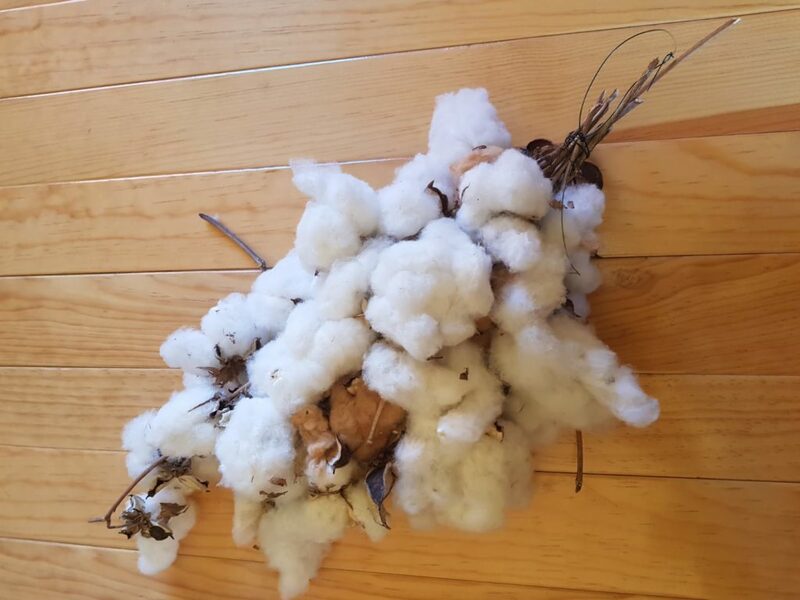 This cotton is in danger of extinction, so we looked very careful and close all the the process. We saw the amount of hours, work and details they put, including their love for each garment. This is the reason why investing in artisan-made products must be made from the heart and love for design, right? The next day, we had another adventure already planned: a trip for three hours to the beautiful community of San Sebastián Río Hondo to see the process of making garments made with organic cotton. 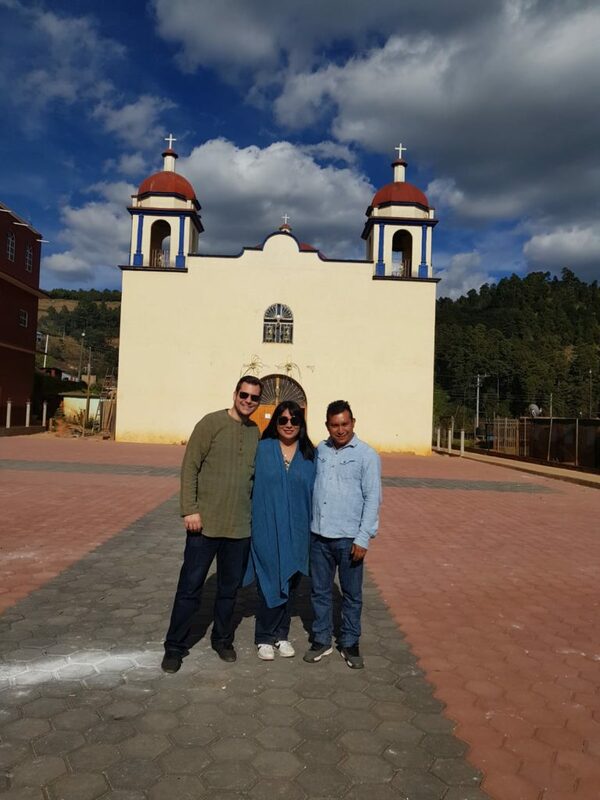 In this beautiful community located in the mountains to the south of Oaxaca, we met Cheo Ramírez and his wife Felipa Ramírez who very kindly took us through the town explaining the whole process. 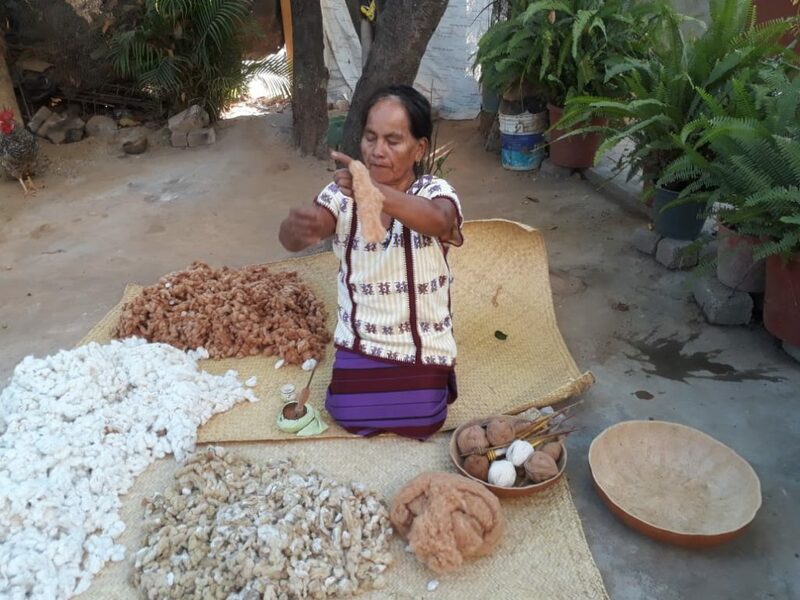 In San Sebastián Río Hondo these artisans also use the “Coyuche”cotton which people from Oaxaca harvest organically, despite not having a certified material, one can see the who process is transparent and 100% hand made by artisans. A bright & wonderful day in which we raised some images to make a small video which we will share with pleasure with all of you and which you will find at the end of this publication. The visit to San Sebastian was nurturing and a learning experience from us, we were guided to see where the process of cotton, how it is thrown and what we found interesting is their method to work with the “spinning wheel”, where the original idea was taken from Mahatma Gandhi. They work with women from the village and nearby ranches who spin the thread, weave the fabric and embroider our designs. They get organic cotton from Katyi Ya’a, a collective of 18 women who spin and weave locally grown, native, organic, naturally colored brown and white cotton (Coyuche). The coast of Oaxaca and Guerrero, the Costa Chica, is one of the few places in the world where naturally colored cotton originates. This makes the process impressive, learning about where the cotton comes from and the people involved in this project. That is what makes it valuable and meaninful for us, entrepreneurs and advocates who aims to commit to culture preservation, heritage and honor our ancestral traditions. Rosendo Martínez, Cheo’s Father working in the pedal loom. 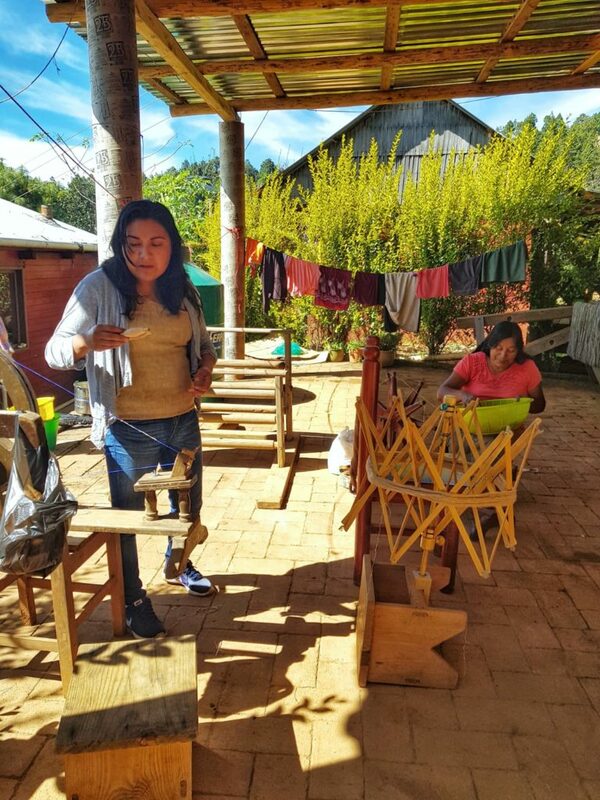 During the last part of our trip we visited other communities like Santo Tomás Jalieza where I practiced to work with the waist loom and where we acquired beautiful belts that will combine perfectly with the huipiles of San Juan Colorado and San Sebastián Río Hondo. We also visited Ocotlan, we saw craftsmen painting and we tasted gastronomic delights in the market, we admired the daily life in near the town kiosk. Without a doubt, our adventure is not limited to just a few words through this text, it is something that we carry in our hearts. We invite you to visit our Instagram and our website to learn more about our project. To finish, once in my hometown, Durango, we made a great photoshot, really grateful for the collaboration with a professional team. . Check out our Instagram for more updates! I would like to end this publication by thanking Slow Fashion World and their founder Mariel Jumpa who has always supported us since the beginning, and who strongly supports and believes in human values in this accelerated world. We also want to thank and recognize the value of work, passion and love with which Mexican artisans work for a better world, to follow their customs. 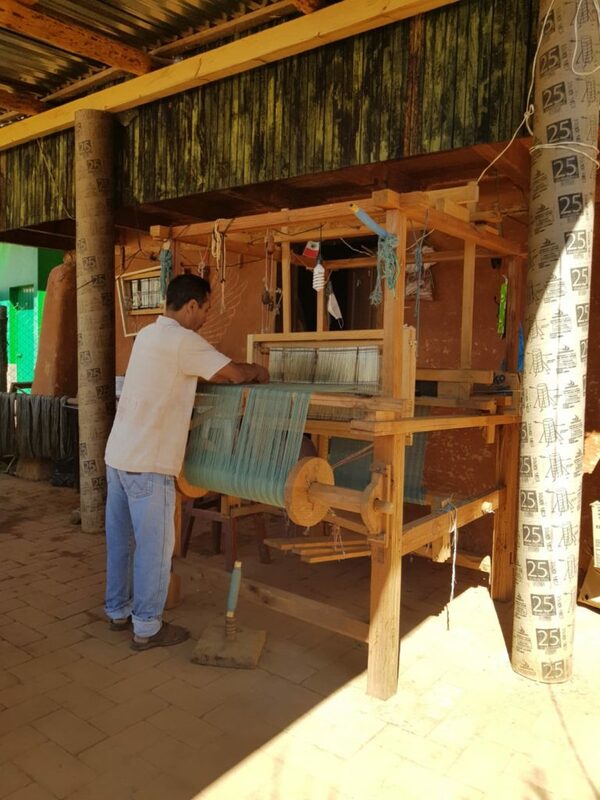 We admire and respect their beautiful work and we want through our project, Bohetnika, to contribute and share the beauty of Mexican textiles and handcraft to the world. 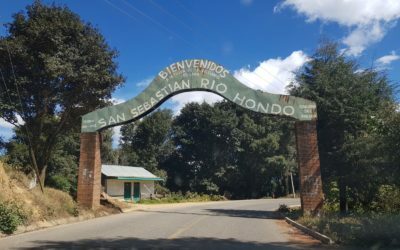 Huipil: San Juan Colorado, Oaxaca. Belt: Santo Tomás Jalieza, Oaxaca. Lizeth Soto Rivas is the founder of Bohetnika. She has been recently assigned as official guide for Slow Travel Community. She is also behind the movement “Goes Latin” PopUp stores around Europe with events empowering Latin American fashion, and designers. She is a graduate and expert in Communications, Social Media currently living in Berlin since 2014. 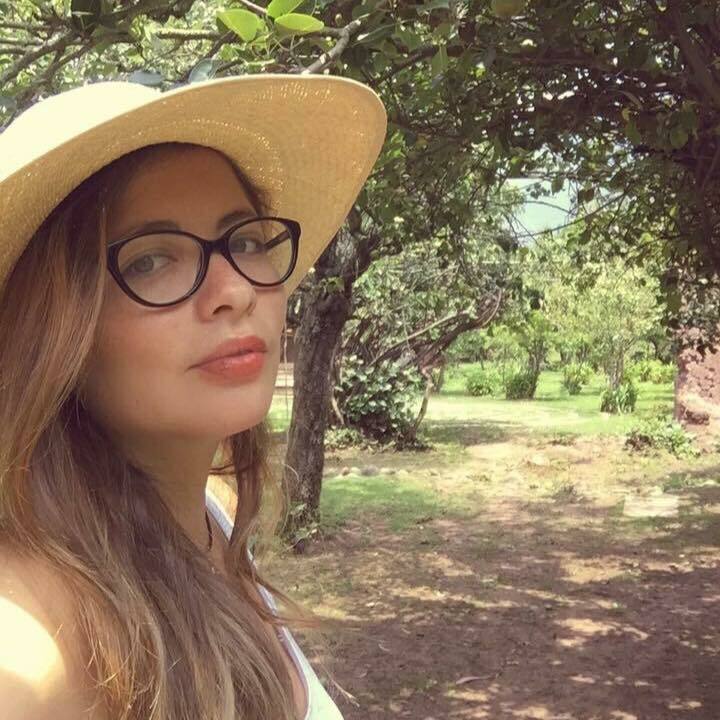 Lizeth travels the world creating strong connections and global network. She loves photography, creative art, and have worked in international and local projects connected to artisan empowerment and textiles. Great news! Kmana is joining our PopUp Store + Events in Paris. Showcasing and selling for a whole week, Kmana is bringing conscious + ethical fashion to our “Creative & Conscious” Paris edition. Let’s introduce you now to a fantastic journey from how it all started for this ethical brand Kmana bags. Change-maker Bea Sanz-Corella was born in Barcelona, Spain. Bea is passionate, kind and strong about her commitment to make a difference. She has built experience and a career around anthropology, economy, yoga. She is also a mother of two wonderful twins. Bea, a go–getter woman ready to show share her positive vibes and charisma to the world with Kmana . This is what I’ve felt when I read about Bea’s story. I am feeling that we will have so great stories with Bea, our community and showcase globally the beauty that Kmana shares through designs and values. Bea’s passion around travelling began when she was a teenager inspired by the novels she’s read, and currently connecting experiences and stories to her life work. She has lived in and travelled all the continents, supporting and connecting like-minded international institutions, organizations and individuals in more than 70 countries, who work towards a better world. In 2013, after some years using the magic Emporda as a base and two years traveling with her family, she landed in Bali and fell deeply in love with the island. Ever since, Bali has been her home, she calls it ”the place to which she returns, to seek refuge and stand still until her next move, and the place where she has finally decided to follow her passion for sustainable design and bags”. After settling in Bali and connect life and beauty of her now home, she decided to follow her passion and during 2015 she launched Kmana, a name that was created from ‘Mau ke mana’ that is Bali’s ubiquitous greeting. Bea quotes “Kmana was born out of a desire to combine ethics and aesthetics, to serve the world’s wanderers. 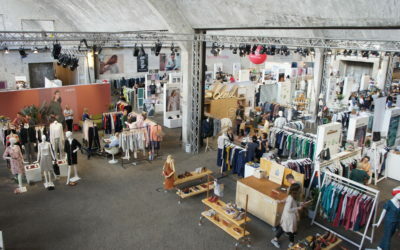 Men and women who, regardless of their age, desire timeless and unisex fashion produced sustainably in small batches”. A wonderful extract of the story of Kmana: The brand began working with a Balinese–Javanese family of gifted leather artisans, hand-crafting oversized bags for ourown travels. Soon afterwards, visiting friends and acquaintances began ordering their own personal bags and accessories. Without realizing, our bags started travelling outside of Bali, to Brisbane, Melbourne, Hong Kong and Barcelona. 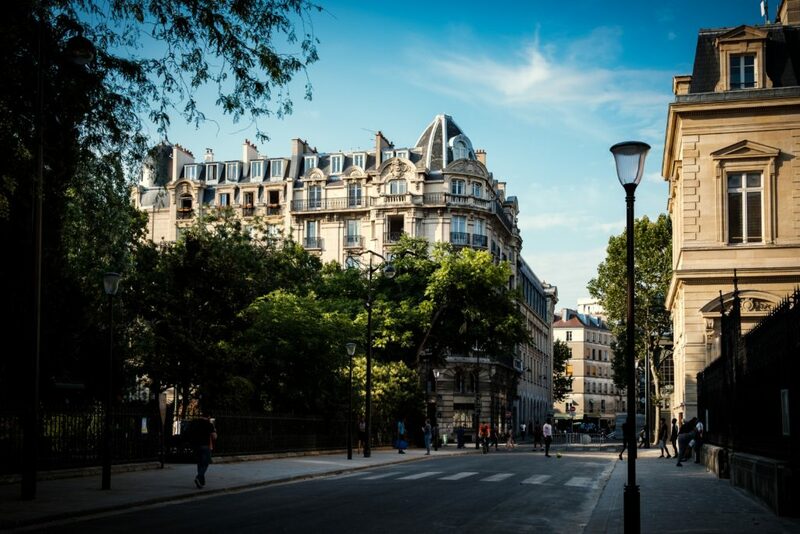 Now together with Slow Fashion World we will be traveling with Kmana to the rest of the world, starting Paris. What Kmana stand up for? Commited to Slow Fashion and developing a strong business with honesty, transparency and ethics, Kmana bags are “made to last decades if not a lifetime, if properly taken care of”. How are the bags made? Check out their website for full information. They make sure that the used is by-product of the food industry. Locally sourced and coming from family-run tanneries in East Jave, Indonesia. 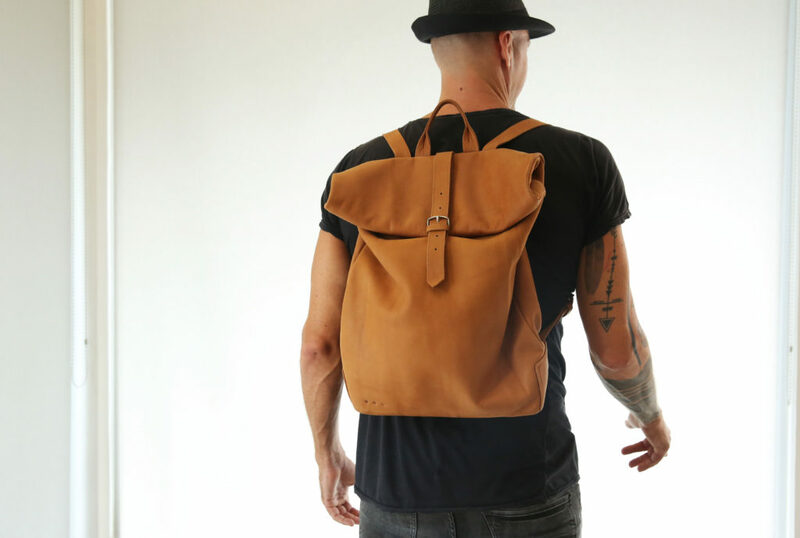 Using one piece of full-grain cow leather or sheep leather (i.e. one hide) for each bag, ensuring fewer seams and improved durability. We partner with like-minded individuals and workshops in Java to ensure the quality and transparency of the tanning process and minimize its environmental and societal impact, namely through the waste management procedures. Tannins used to tan our vegetable-tanned bags are found in the local tree barks and leaves. 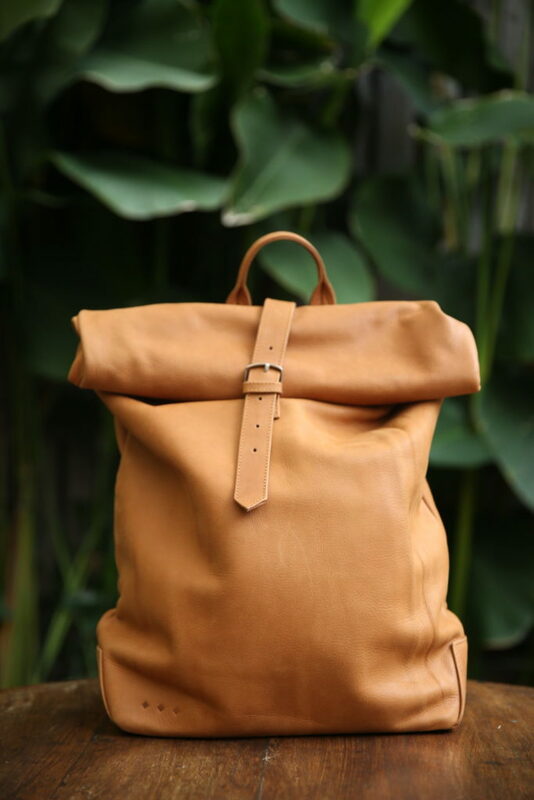 The other elements of the bags is hand-made, traceable and, to the maximum extent possible, ethically sourced. 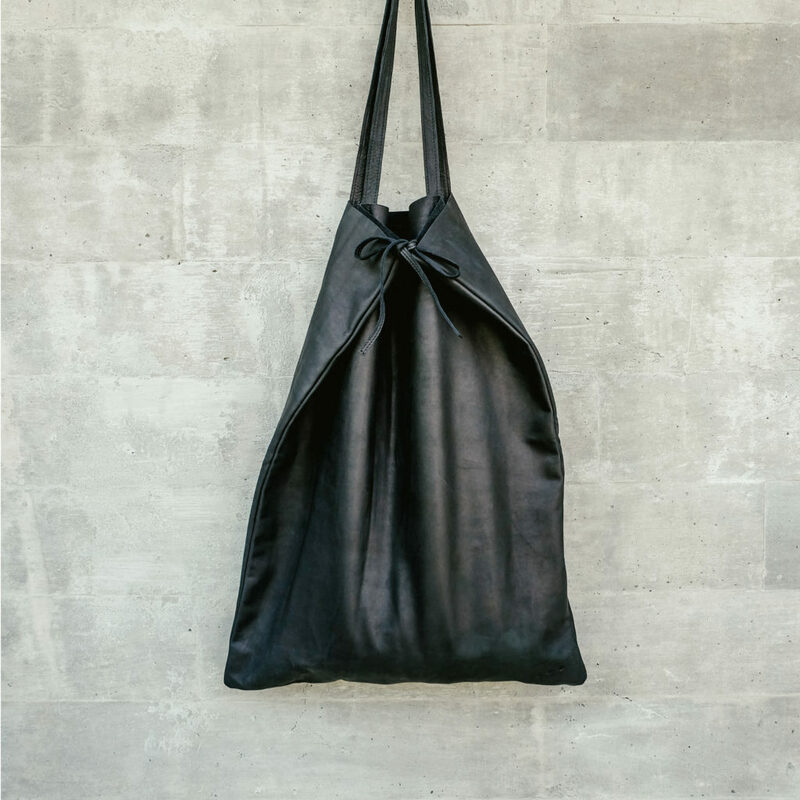 Kmana is strongly committed to continue researching the vegan option for our bags and to launch a vegan line, free from scary materials like PVC or polyurethane. What story is behind the Maya colection? Renaissance woman. Tall and regal, with a deep majestic voice, she was unforgettable whether encountered through sight, sound or the printed word. Kamana inspires the world by creating pieces that last and having a solid family that stands under ethical and quality values. Kmana bags are the ideal gift and must have for your next travel. For more about Kamana visit Kmana Concept. Founder Slow Fashion World. 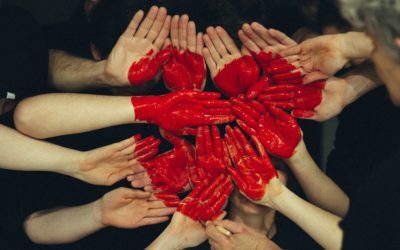 Passionate about connecting global and local communities for change. She champions diversity and consults start-ups, companies in sustainability, marketing strategy and business development.